PHOTO: The innovative Loft Staterooms flood the lower-level accommodations with light. Tauck, the upscale tour operator, has gotten into the river cruise market in a big way. The company introduced two new riverboats this year and has plans for one more next April and two more in 2016. The ambitious newbuild program will help Tauck meet growing demand. In fact, CEO Dan Mahar expects 2014 to be another record year for the company overall, which does about 80 percent of its business in land tours. Many Tauck land customers take river cruises, but the river sailings also bring new people to Tauck. Tauck offers a similar ambience on its river cruises as it does on its land trips — upscale, inclusive and personal. 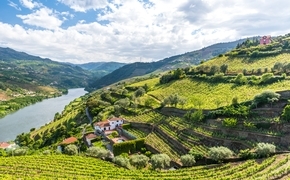 For example, the river cruises are staffed with a Tauck cruise director and three Tauck Directors, who travel with the guests on shore excursions and are highly visible throughout the journey, giving the entire trip a more personal feel. Tauck first chartered a riverboat in 1991 and built the first ship to its own specifications, the Swiss Emerald, in 2006. This year, Tauck added its fifth and sixth European riverboats, both part of the new 130-passenger Inspiration Class of ships. The first was the ms Inspire, which entered service in April. It was followed by the ms Savor in June. Together, the pair increased Tauck’s river cruise capacity by 55 percent. The company will introduce the Esprit, the fifth vessel in the 118-guest Jewel Class, in April, as well as two more 130-passenger Inspiration-Class ships in 2016. The new Esprit will operate on the Rhine, Main and Danube rivers, offering 14-night cruises between Amsterdam and Budapest, and seven- and 12-night voyages between Basel and Amsterdam. The ms Savor was christened on June 21 in the Rhine River town of Bingen, Germany, by Liz Tauck Walters, daughter of company chairman Arthur Tauck Jr. and a board director. With the Inspiration Class, Tauck sets a new standard of spaciousness. The ships are 443 feet long with 67 cabins and suites. Other lines with ships of similar length generally carry more passengers. For example, Viking River Cruises’ Longships are 443 feet long and carry up to 190 passengers, 46 percent more than Tauck’s ships, in 95 staterooms. Here is a summary of the ms Savor’s features. The ms Savor offers 22 suites that measure 300 square feet; they have two French balconies with floor-to-ceiling windows, walk-in closets, a pull-out couch, and marble bathrooms with rain showers. There are 32 staterooms that encompass 225 square feet. They all have a pillow-top, queen-size bed (convertible to twins), a 32-inch LED television, a minibar replenished daily with complimentary water and soft drinks, a full-size bathroom with a hair dryer, a large shower with a rainfall shower head and 220v and 110v outlets in cabin and bathroom. 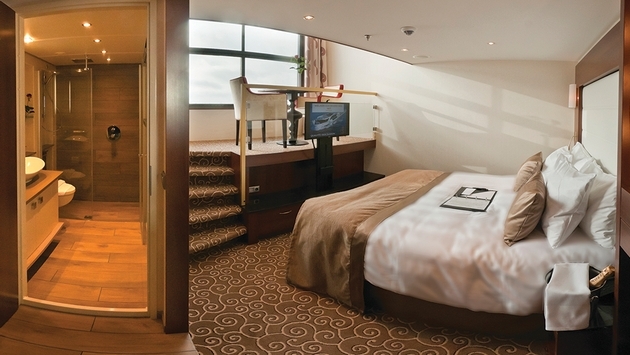 Of these staterooms, 24 have one floor-to-ceiling French balcony with a sliding door. The other eight are located on the lowest level and are the extremely clever Loft Staterooms. Tauck met the challenge on the Inspiration Class with the Loft Staterooms, which add a high ceiling with a huge window that actually opens. The platform and window are raised above the water line, while the bulk of the cabin and bathroom are below water. Five steps lead up to the platform, which has a table and two chairs and a view from just a foot or two above the water line. The middle part of the huge window opens with a push of a button, as do the window’s drapes and sheer shade. The Savor also has 13 cabins of 150 to 190 square feet. Four of the smaller size staterooms on the lower level are reserved for solo travelers and carry no single supplement. The main dining room, Compass Rose, is located on the second deck. Breakfast is served in the morning as a buffet, although there is a good selection of hot items that can be ordered from the server. That menu includes eggs cooked many ways, including poached as Eggs Benedict and in omelets, as well as pancakes (blueberry, banana, chocolate chip, etc. ), French toast, and Belgian waffles with fruit. The restaurant has open seating for lunch and dinner. The evening meal offers four courses, an appetizer, soup, entrée and dessert. The choices might include a snow crab and avocado salad or a Caesar salad, parsnip and pear soup or double-beef consummé, roasted rack of lamb, horseradish-crusted baby cod, vegetable kabob with a selection of European cheeses or sweets for dessert. Always available selections are chicken breast, New York steak and Atlantic salmon, served with vegetables and baked potato. Red and white wines are poured with lunch and dinner. In fact, starting this year, Tauck river cruise fares include unlimited spirits, wine, beer, specialty coffees and soft drinks. The Savor also has an alternative dining venue called Arthur’s, named after the company chairman, of course. The more casual spot, located on a third level aft, serves light breakfast and lunch and in the evenings turns into a steakhouse-style eatery with food prepared in its own galley. The menu includes mixed green or Caesar salad, French onion soup, surf-and-turf, rib-eye steak and filet of King salmon. Of course, some lunches and/or dinners are on land as part of the company’s meticulously planned shore excursions. One day, guests might be eating a delicious buffet lunch at the grand old Eisenhut Hotel in the heart of medieval Rothenburg, Germany. The next evening, dinner might be served in the wine cellar of the Würzburg Residence, a palace that is a UNESCO World Heritage Site. Onboard the ship, vegetarian meals are always available. When the weather permits, there is al fresco dining on the Sun Deck. American breakfast room service is available to those who book Category 7 suites. All guests can order complimentary snacks from 10 a.m. to midnight for delivery within 30 minutes to desired locations. Options include “Snack Attack,” a selection of cheese, crackers, bread and nuts; “Sweet Time,” cookies and baked goods. Other choices include fresh fruit, ice cream and hot pretzels. 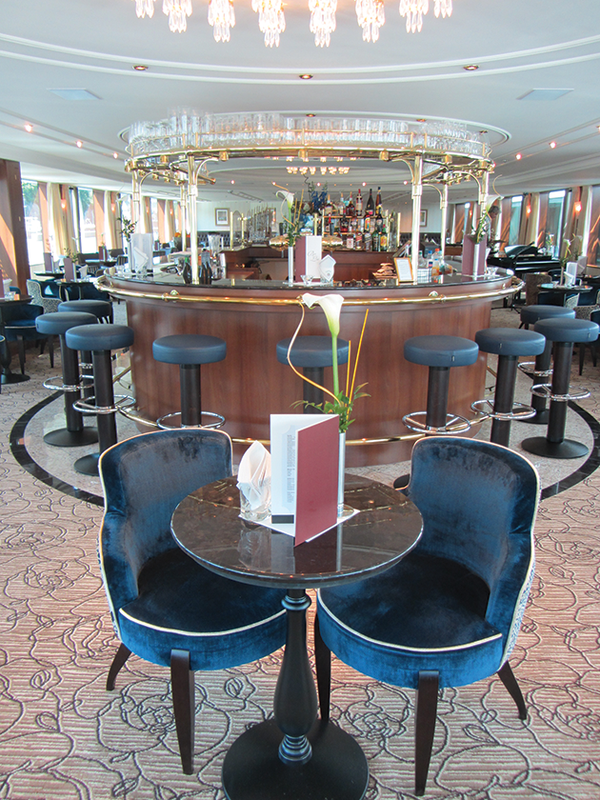 PHOTO: The Panorama Lounge is a gathering place on Tauck’s ms Savor. Guests can gather on the Sun Deck when the weather — and low-bridges — allow. The top deck has tables and chairs suitable for eating or playing cards as well as loungers. Much of the seating is covered by an awning that provides shade. There’s also a hot tub and a putting green. The Panorama Lounge on Deck 3 is the venue for daytime enrichment, such as a lecture or glass-blowing demonstration, and evening entertainment, which might be a Bavarian oom-pah band or a pianist. The ship has a small exercise room with treadmills, stationary bikes and a yoga mat. The small spa offers some treatments, such as a 50-minute, full-body massage for about $70 or a Thai foot massage that is $40 for 30 minutes. Laundry services are also available. The ship carries bicycles for guest use. Staterooms are stocked with Vox listening devices for use on shore excursions, and they really help in hearing the guides during walking tours. This year, the Savor will operate two itineraries — the 12-day The Blue Danube priced from $4,790 per person plus airfare and the 10-day Danube Reflections from $4,590. Tauck river cruise fares include shore excursions, gratuities, onboard spirits, wine and beer, port charges and airport transfers. For 2015, it will be deployed on the Western Danube. For more information, call 800-468-2825 or visit www.tauck.com.